Britain is celebrating the Queen's Diamond Jubilee with an extra holiday today, so I have my husband at home with me. Yay! This week's kits are called Prehistoric Fun and Picnic. 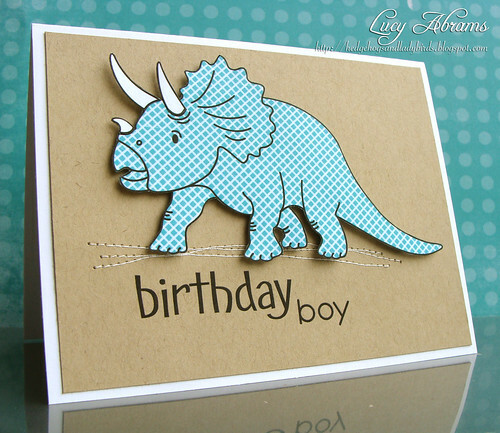 Today I have a couple of kids' cards made using the Prehistoric Fun kit. And I certainly had fun with it, creating this silly polka dot T-Rex. Love that polka paper from Echo Park's Summer Days kit. Back soon with more cards for this week's releases. 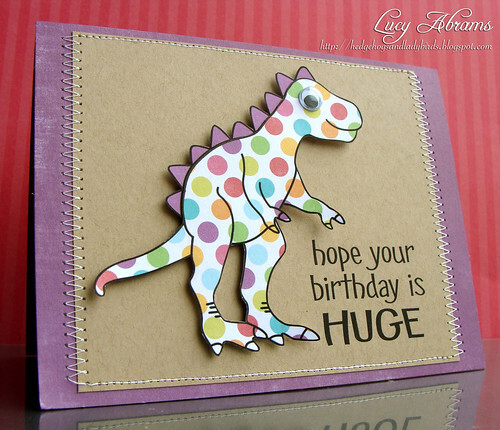 Love the dinosaurs Lucy - Fab cards as usual. Too cute, Lucy! Love the paper pieced dinos--and the googly eyes! Love your unique and colorful perfect cards for boys! Love the polka dot t-rex!hilarious! That lovely patterened steggy is fantastic though, may have to give that a go! Love patterned pp on these pre-historic animals! Oh, I adore these cutie cards. I am going to make a whole set with that digikit for my 4 year old son. Thanks for the inspiration!